Port Replicator: EURO2 Advanced E-Port II with USB 3.0, 130W AC Adapter without standMaximize your workspace with the Dell™ E-Port Plus Replicator. This E-Port Plus Replicator gives you a comfortable work space where you can plug a keyboard, mouse and monitor to the port replicators and use your laptop like a desktop! Simplified connectivity facilitates a single interface to connect to your printer, monitor or other peripheral devices. It also gives you ease of mobility wherein you need not unplug and re-plug multiple peripherals to access your printer or other devices. 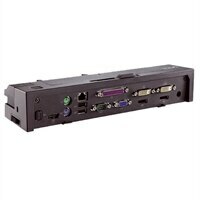 This product is tested and validated with Dell Systems. It is supported by Dell Technical Support, when used with a Dell system.